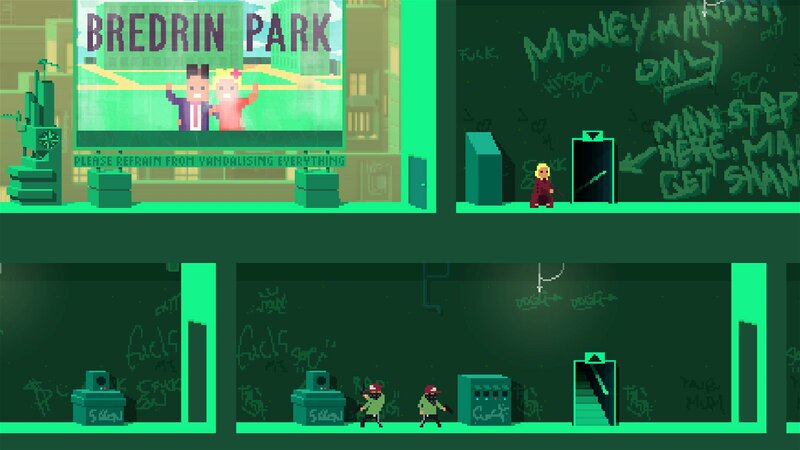 From the moment I read the description, saw the art style, and noticed who was publishing Not a Hero, I couldn’t help but draw comparisons to the popular Hotline Miami franchise. I know, I know – they’re developed by entirely different groups of people, but they just feel so similar it’s hard to not think of one while playing the other. Both embrace a decidedly retro aesthetic that permeates not only every ounce of the visual presentation, but bleeds into the soundtrack as well. It’s hard not to bop your head while playing, especially while using headphones. Everything starts out innocently enough. You begin the game as Steve, the campaign manager for BunnyLord, the mayor of the city. In order to get voters on his side, he vows to rid the city of all crime and tasks you with fulfilling that promise. 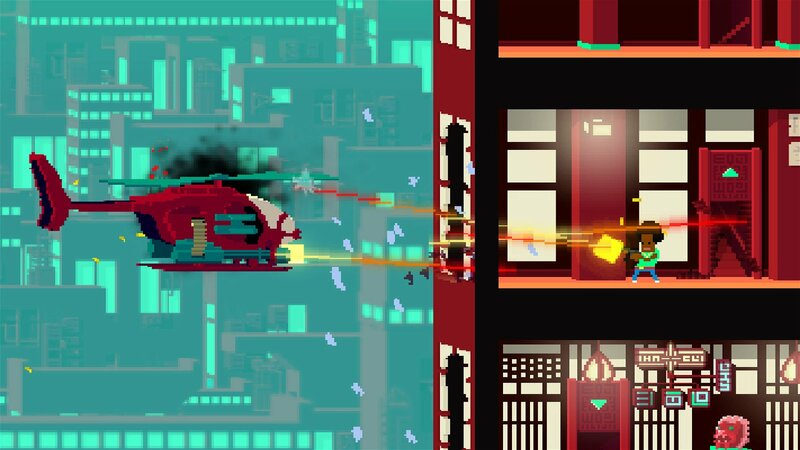 Naturally, that means clearing out dozens of buildings filled to the brim with “criminals” using a variety of weaponry that mutilates their pixelated bodies in spectacular ways. 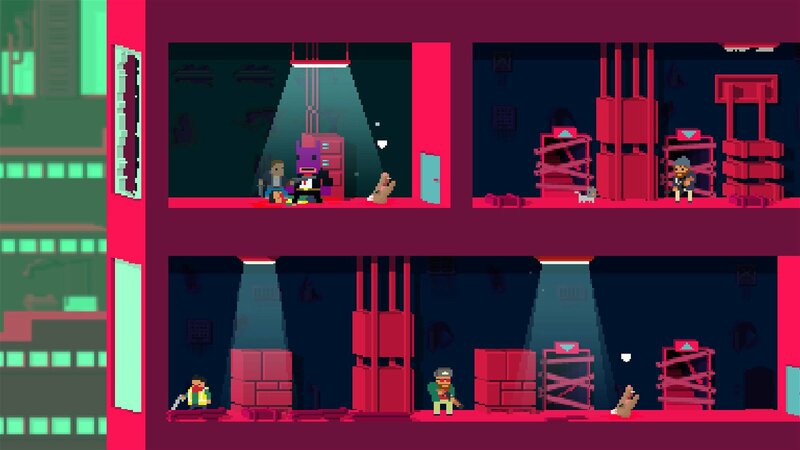 Make no mistake: just because this game uses a lot of pink, features an upbeat soundtrack, and posits a talking pink bunny as one of the primary characters, does not mean it’s for the faint of heart. There’s a lot of blood here and a lot of pretty awful acts going on. 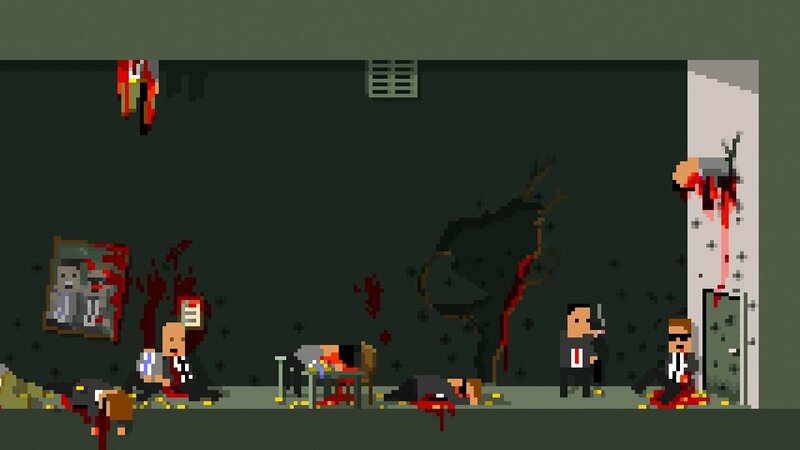 But at the same time, Roll7 managed to make Not a Hero not only hilarious due to the juxtaposition of brutal gore and innocent visuals, but the team also managed to make it pure fun as well. Sliding in and out of cover and executing enemies just before they blast you with a shotgun never stopped feeling satisfying. Each mission begins with a simple task that usually ranges from do X of this thing, get X of that thing, or bring X to X. The mission objectives themselves aren’t usually very inspiring, but it’s enough to push you forward with a purpose. These main objectives, which are communicated in large letters near the bottom of your screen, must be completed in order to pass the level. In addition to your main objective, each mission also has a series of secondary objectives as well. These feature much more variety and can range from anything like collecting objects, getting a certain number of critical kills, using certain weapons, stringing together killstreaks without taking damage – you get the idea. Completing these objectives will net a better approval rating and varying grades for mission completion. It’s a simple system, but it keeps you going for the handful of hours that the journey lasts. Surprisingly, each of the different characters actually have a surprisingly high level of variation between them. For example, the starting character, Steve, has a simple pistol, reloads quickly, and has one of the better slide-kick moves. While Cletus reloads very slowly with his barrel shotgun, but can shoot open doors and actually knock enemies backwards with each blast. Then there’s Samantha – my favorite of the bunch – who can execute enemies quickly and shoot or reload her gun while moving. There are six other characters to unlock as your approval rating increases and all of them feature a similarly varied set of abilities. 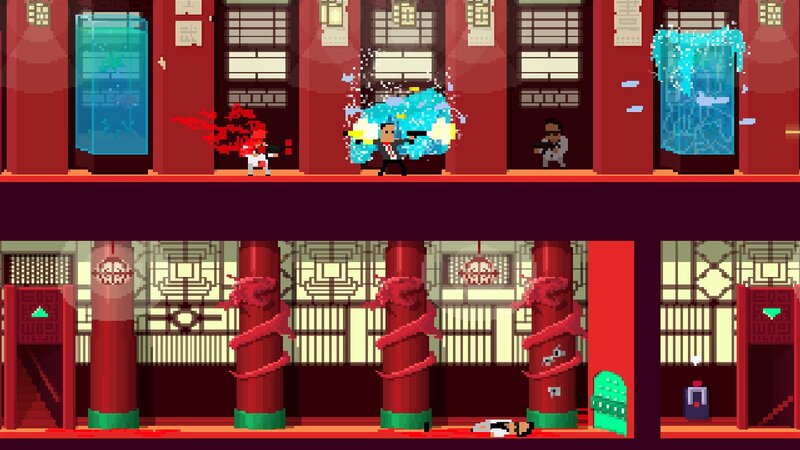 Not a Hero’s Steam page touts that they’ve created “the greatest 2¼D cover-based indie shooter of all-time, ever,” and, I’ve got to say, they aren’t wrong. Granted, it’s likely one of the, if not the, only game that specifically fits those criteria, but it’s an entertaining game nevertheless. During the romp around town, I had a fun time, but it wasn’t a road without bumps. One of the things that made Hotline Miami such a powerful game, was the message it had about violence in general. I can’t necessarily fault Not a Hero for not touching on subjects another game does touch on, but it leaves the experience feeling much more shallow and superficial. And while the cover system is surprisingly engaging for a 2D game, it’s incredibly finicky and I found myself outside of cover on more than one occasion simply for being off by just a few pixels. In the end though, I had a great time with it. Not a Hero may not have as much to say about violence and the brutality we take part in, but it sure does make it fun. 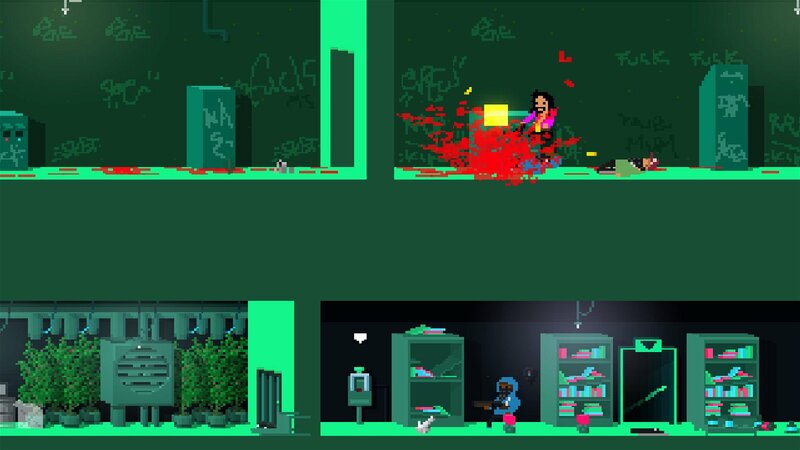 Not a Hero’s Steam page touts that they’ve created “the greatest 2¼D cover-based indie shooter of all-time, ever,” and, I’ve got to say, they aren’t wrong.